Argentina is the fifth biggest producer of wine in the world, and was the largest outside of Europe up until the mid 1990’s. However, economic collapse in the late 90’s/early 2000’s meant that the quantity of wine produced reduced significantly, and wines were marketed more for the international market, as the low value of the Argentine Peso meant wine from the region was incredibly cheap. Unfortunately to begin with the wines produced were low quality, but over the years the quality has improved, leading to some very high quality wine being produced. Argentina is now famous for making some world class reds. 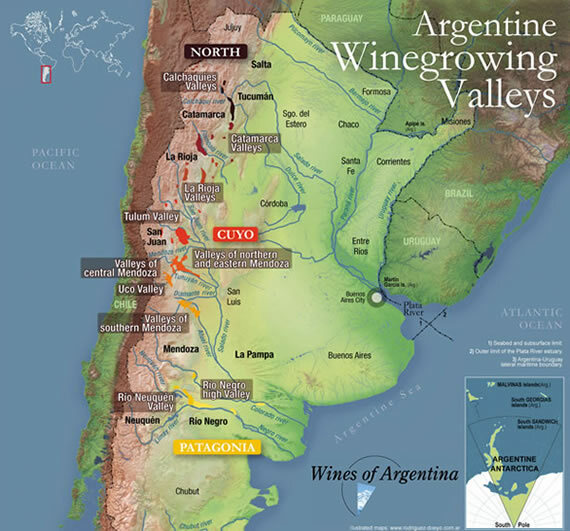 Argentinian red wines are dominiated by Malbec, with around 20,000 hectares of Malbec grape planted in the country. Although the grape is native to France, Argentine Malbec’s are widely regarded to be the best in the world, largely because the grapes are more suited to the climate than in their native country. Cabernet Sauvignon is also grown regularly, sometimes used on it’s own as a straight varietal – which can be excellent quality. It’s also often blended in with other Bordeaux grapes like Malbec, Merlot, Cabernet Franc and Petit Verdot. Syrah has also grown in popularity recently, with 10,000 hectares of it grown, particularly in the San Juan region.